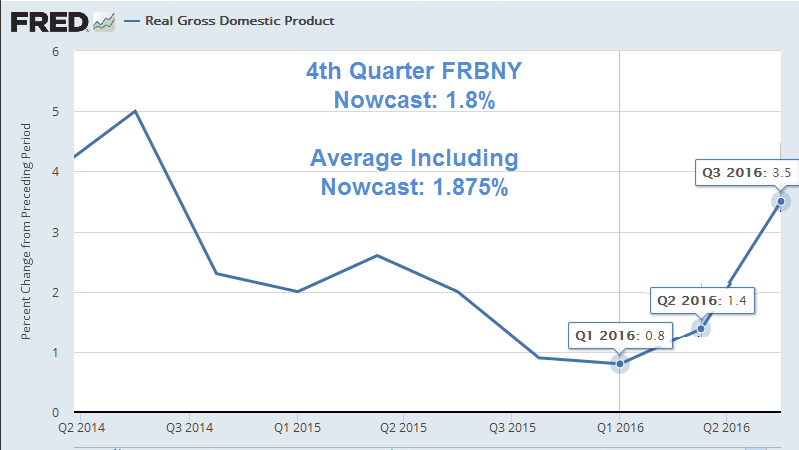 3rd Quarter GDP Revised From 3.2% to 3.5%: What About the Entire Year? The BEA released its Third Estimate of Third Quarter GDP today. In the third estimate GDP rose at 3.5% annualized, up from 3.2%. The acceleration in real GDP in the third quarter primarily reflected an upturn in private inventory investment, an acceleration in exports, a smaller decrease in state and local government spending, an upturn in federal government spending, and a smaller decrease in residential investment, that were partly offset by a smaller increase in PCE and an acceleration in imports. 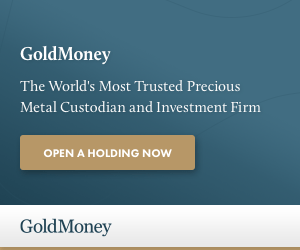 The price index for gross domestic purchases increased 1.5 percent in the third quarter, compared with an increase of 2.1 percent in the second quarter. The PCE price index increased 1.5 percent, compared with an increase of 2.0 percent. Excluding food and energy prices, the PCE price index increased 1.7 percent, compared with an increase of 1.8 percent. 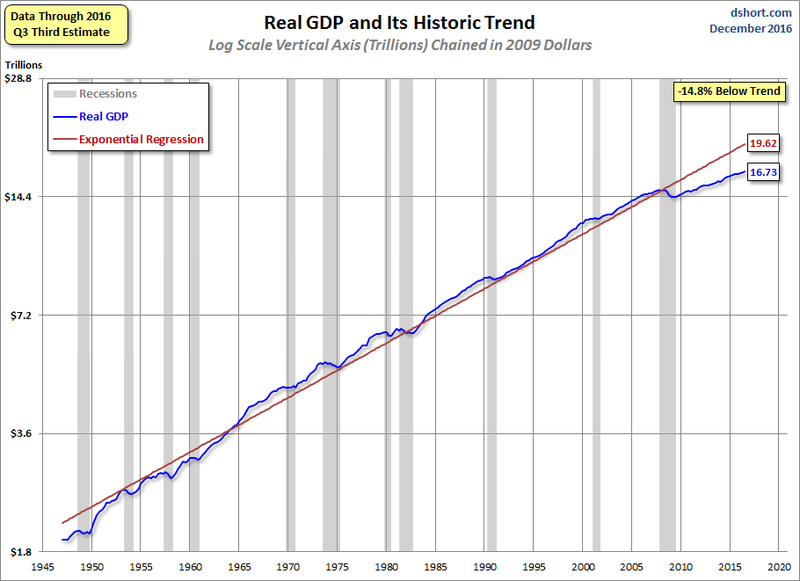 Doug Short at Advisor Perspectives provides some interesting charts and commentary. Today’s number is 14.8% below trend, the largest negative spread in the history of this series. “A particularly telling representation of slowing growth in the US economy is the year-over-year rate of change. The average rate at the start of recessions is 3.35%. 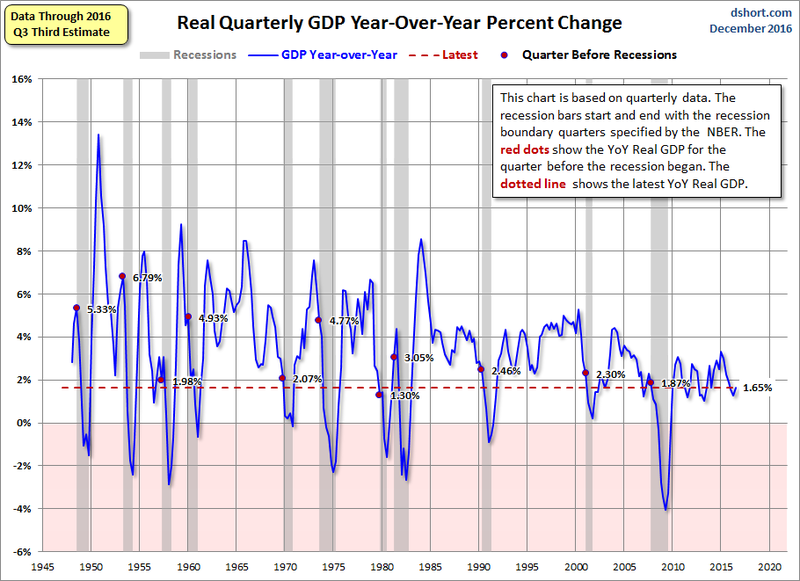 Ten of the eleven recessions over this timeframe have begun at a higher level of real YoY GDP,” comments Doug Short. If we take into consideration the most recent Nowcast report from the New York Fed, growth for all of 2016 will be close to 1.875%. There is a new Nowcast tomorrow and I actually expect it to go up slightly based on news this week. GDPNow has a estimate of 2.6% for 4th quarter. Both report tomorrow. Oooooo … I can hear all the “experts” now – can’t have a recession with that level of growth (and acceleration). There are a lot of factors that are pointing towards an upcoming recession. We had the dot com crash followed by the housing crash. Next up is the global bond bubble crash. keeping it simple works best for me.